This classic design is based on a damask wallpaper in Sanderson's Richmond Hill collection. 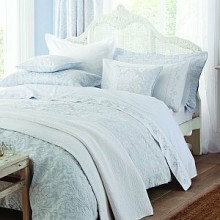 It has been translated into this softly textural pale blue jacquard weave bedding collection. Perfect to layer with crisp white linen.